Air Tech Services specialise in the service and commissioning of all City Multi Installations and have the latest computerised service tools required for this advanced technology. 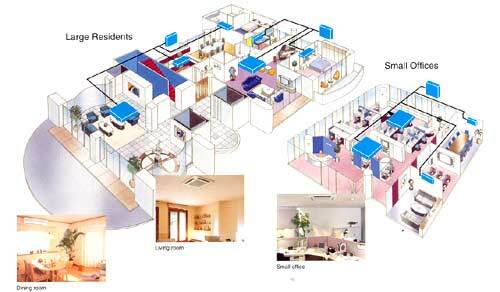 The all-in-one air conditioning solution for large residences or offices with multiple rooms. Mitsubishi Electric's Multi-S series is exceptionally well suited for houses with large living rooms and multiple bedrooms or children's rooms. This is because different types of indoor units can be selected, and a maximum of 8 indoor units can be connected to a single outdoor unit. Furthermore, if the total piping length is less than 50m, there is no need to add extra refrigerants. This system offers excellent cost savings and is very suited for small office applications. A world only and first simultaneous heating/cooling 2 pipe system - the most cost effective. The R2 system provides simultaneous cooling and heating. 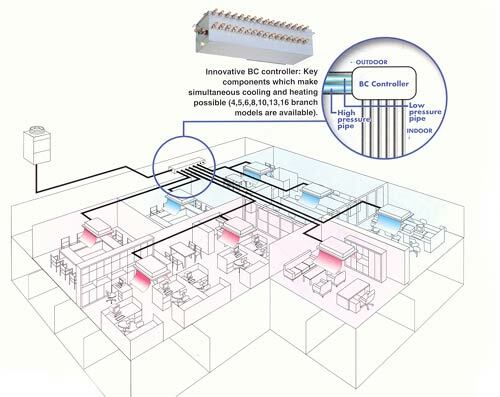 With the BC controller connecting several indoor units to one outdoor unit using only two pipes and energy saving heat recovery operation, economy and efficiency are guaranteed. Smooth auto-switching (heating/cooling) based on a set temperature realises convenient operation and a comfortable environment. 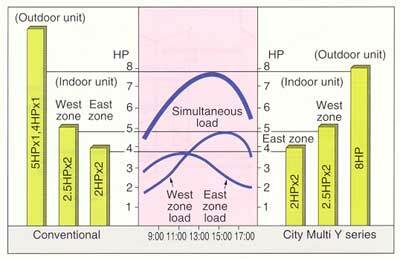 Outdoor unit capacity can be smaller than total indoor unit capacity when indoor units have varying peak times. Maintains comfort conditions at lower cost. An inverter is used to control capacity in response to the air conditioning load, which changes constantly over time and according to the zone involved. This enables the units to deliver superior performance in terms of both comfort and running costs. Moreover, Mitsubishi Electric has developed an original single inverter compressor which helps to save energy by eliminating the switching loss that occurs when multiple compressors are used. The linear inverter thus provides just the right solutions for meeting the requirements of diverse load variations. 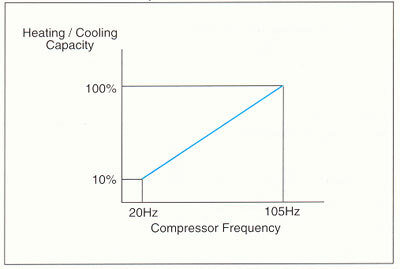 Optimised control of compressor frequencies in relation to the cooling-heating load results in minimal energy costs.